Designed for computer networking. The unique toolless design does not require the use of a crimping tool. Designed for voice application. The unique tool-less design does not require the use of a punch-down tool. Designed for computer networking. Provide superior performance and reliability, supporting up to Gigabit Ethernet applications. Designed for High Density blank patch panels but also compatible with wall plates and blank patch panels. CAT6 RJ45 110 Type 180 Degree Keystone Jack is 8-position 8-conductor (8P8C) and designed for computer networking. It is engineered to provide superior performance and reliability, supporting up to Gigabit Ethernet applications. The advanced printed circuit board design is tuned to provide optimum signal quality with maximum headroom, allowing it to exceed TIA/EIA Category 6 performance standards. Designed for computer networking. Supporting up to Gigabit Ethernet applications. Exceed TIA/EIA Category 6 performance standards. 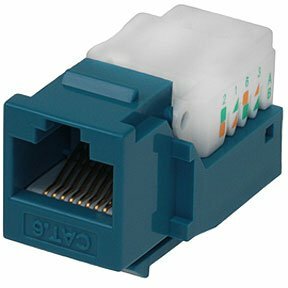 Cat6 RJ-45 shielded keystone jack is 8-position 8-conductor (8P8C). Designed for computer networking. It is engineered to provide full shield protection and reliability, supporting up to Gigabit Ethernet applications. The advanced printed circuit board design is tuned to provide optimum signal quality with maximum headroom, allowing it to exceed TIA/EIA Category 6 performance standards. Use with SF Cable shielded Ethernet cable. Zinc die-cast housing for maximum shield protection. Designed for Cat6A blank patch panel. Compatible with wall plate and patch cables. These keystone jacks are for RJ11/12 or RJ45. They come in 110 punch down or tooless varieties. Our keystone jacks can be used for patch panels, wall plates, and surface mount box. You can choose from RJ45 Cat6 UTP toolless keystone plugs, RJ11/12 (Cat 3) toolless keystone jacks, Cat 5E RJ45 110 type shielded keystone jack, Cat6 RJ45 110 type keystone jacks, Cat6 RJ45 110 type shielded keystone jack, UTP keystone jack, STP shielded keystone jack, toolless keystone jack, punchdown 110 type keystone jack, and many other products. All our products are quality checked before they reach you and are up for after sales services. You also get lifetime technical support on all products ordered from SF Cable.